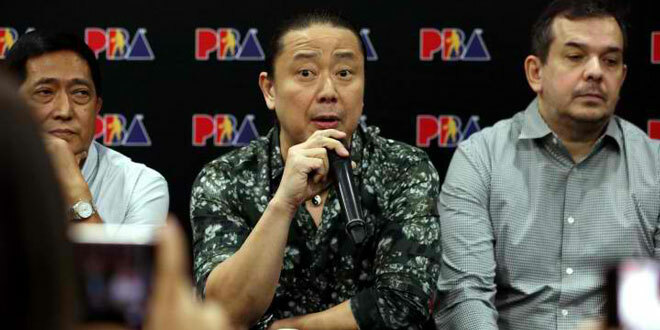 San Miguel Corp. (SMC) sports director Alfrancis Chua on Friday night vehemently denied claims they are withholding star players from their three Philippine Basketball Association (PBA) clubs for national team duty. Ever since the Samahang Basketbol ng Pilipinas (SBP) became the official national sports association for basketball, a frequent conversation among local fans is about the SMC, a corporate rival of the MVP Group, which bankrolls Gilas Pilipinas, allegedly withholding its star players from playing for flag and country. “Hindi ho totoo na ang San Miguel, ang ganito, ayaw magpahiram (It’s not true that San Miguel does not want to lend its players),” the former champion coach, currently the governor of Ginebra in the PBA board, said in a press conference called by the league at the Smart Araneta Coliseum in Quezon City just before Game 1 of the PBA Commissioner’s Cup Finals between Barangay Ginebra and the San Miguel Beermen. In fact, Chua even said that he is willing to lend the core of the Beermen, led by current national team player Junemar Fajardo, to the Asiad. “Actually po, a couple of months ago, noong umupo po si Mr. (Ricky) Vargas as chairman, I told him, ‘Ako na ang nagsasabi. Tanggalin na yung one (player) per team. Kahit ilan ang gusto niyo sa San Miguel group, magpapahiram kami,'” Chua quipped. He later added that Fajardo opted to take a rest after the conference to gear up for the fourth window of the FIBA World Cup Qualifiers. Chua then insisted that top rookie pick Chris Standhardinger is also ineligible to play for Gilas in the Asian Games, owing to a rule that actually barred naturalized player Andray Blatche from joining the previous edition of the quadrennial meet in 2014. “Sinasabi ko yan sa board, ‘Baka di niyo alam ang rule. Ang rule, kailangan three years dito nakatira bago pwedeng maglaro.’ So kahit si (Jordan) Clarkson, di ho pepwede. Hindi pwedeng makalaro,” Chua further said. Earlier Friday, Vargas, who is also the Philippine Olympic Committee (POC) president, said that if the SBP opted not to withdraw its men’s basketball team, the chance of the Cleveland Cavalier playing for Gilas is only at 30 percent as the SBP can ask the Olympic Council of Asia for an exemption owing to the fact that Clarkson is playing overseas. Chua previously revealed on Tuesday during the pre-Finals presser at the nearby Sambokojin Restaurant that the SBP and the PBA initially offered the Beermen the core team set-up for the national team that will play in Jakarta, only that the fatigue factor stemming from their Philippine Cup title conquest led to both parties settling to await the results of the elimination round of the next conference, which eventually ended up with the Rain Or Shine taking the top seed entering the playoffs.